MALE FUSIBLE LINKS. Buy quality Auto and Marine Electric Parts and Accessories online, Sydney. 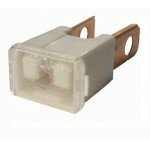 FLM20Male Fusible Link 20 amp White colour, sometimes light blue! 24mm x 15mm x 47mm longNARVA..
FLM30Male Fusible Link 30 amp Pink colour 24mm x 15mm x 47mm longNARVA 53130 Supplied: each..
FLM40Male Fusible Link 40 amp Green colour 24mm x 15mm x 47mm longNARVA 53140 Supplied: each..
FLM50Male Fusible Link 50 amp Red colour 24mm x 15mm x 47mm longNARVA 53150 Supplied: each..
FLM60Male Fusible Link 60 amp Yellow colour 24mm x 15mm x 47mm longNARVA 53160 Supplied: each..
FLM70Male Fusible Link 70 amp Brown colour 24mm x 15mm x 47mm longNARVA 53170 Supplied: each..
FLM80Male Fusible Link 80 amp Black colour 24mm x 15mm x 47mm longNARVA 53180 Supplied: each..
FLM100Male Fusible Link 100 amp Dark Blue colour 24mm x 15mm x 47mm longNARVA 53190 Supplied:..
FLM120Male Fusible Link 120 amp Grey colour, sometimes dark brown. 24mm x 15mm x 47mm longNARV..